Works to advance the frontiers of the behavioral and social sciences and education and their applications to public policy. Conducts a range of activities where policy meets the life sciences, including the environment, geography, laboratory animal use, and natural resource issues. Focuses on government missions in defense, space, and aerospace; national infrastructure challenges; science and engineering disciplines; and continuing assessments of federal labs and research programs. Works to improve S&T public policy, understanding, and education, particularly with regard to national strategies and resources, global affairs, work force, and the economy. Provides leadership in transportation innovation and progress through research and information exchange. Thirty-year research program that focuses on human health, environmental protection, and oil system safety in the Gulf of Mexico region. A new recommends steps U.S. communities can take to better measure their progress in building resilience to disasters, including measuring resilience around multiple dimensions of a community, and incentivizing the measurement of resilience. Current evidence supports the classification of the contemporary red wolf as a distinct species of wolf, although additional genomic evidence from historic wolf specimens could change that assessment, says a new . A new calls for different approaches to assess and manage urban flooding, which is compounded by land use and high population density as well as sea-level rise and more frequent heavy precipitation events. 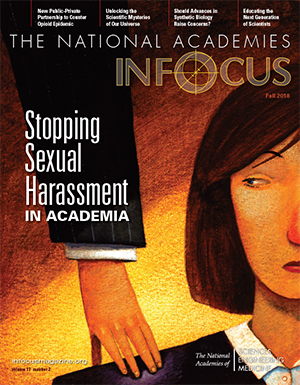 , a magazine featuring the activities and work of the Academies. Report to Congress, which highlights the Academies' work from 2017. The mission of the National Academies of Sciences, Engineering, and Medicine is to improve government decision making and public policy, increase public understanding, and promote the acquisition and dissemination of knowledge in matters involving science, engineering, technology, and health. Our independent, expert reports and other scientific activities inform policies and actions that have the power to improve the lives of people in the U.S. and around the world. Seven major programs conduct studies, facilitate workshops, and undertake other activities: Behavioral and Social Sciences and Education; Earth and Life Studies; Engineering and Physical Sciences; Health and Medicine; Policy and Global Affairs; Transportation Research Board; and the Gulf Research Program. The National Research Council's rules and regulations govern this work.